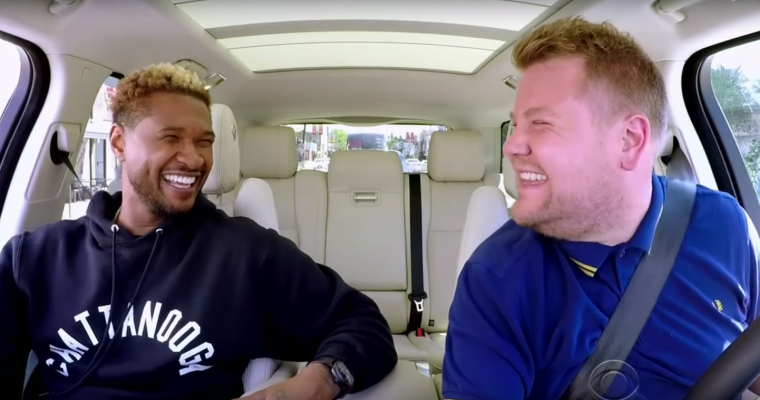 In yet another panicked effort to get to work on time, James Corden called up his friend Usher to help him use the carpool lane on The Late Late Show‘s hit segment, Carpool Karaoke. With Usher in the front seat, it’s no surprise James Corden flipped on the radio for some throwbacks. The two belted out some of Usher’s earlier hits, “Yeah” and “Caught Up,” as they made their way through L.A.’s infamous traffic. While we are always thoroughly impressed with James’ singing skills, sitting next to Usher, he suddenly became worried his dancing skills were not up to snuff. “Would I be able to show you what I’ve got in the club?” James asked Usher. “You can just give me some pointers.” He continued to throw in some out-of-date slang, making Usher and the rest of us cringe-laugh in our seats. A kind Usher agreed and the two pulled into a nearby parking lot to upgrade James’ “swag.” But his “cool” walk turned out a bit more like he was dancing to show tunes. Unfortunately, Usher’s only advice was to remove the jazz hands and add swag (as if it’s that easy, Usher). Once they determined dancing in the club might not be for James (he swore off ever going to a club with Usher – ever), they continued their morning commute. But on the way, Usher’s face lit up when he saw his Hollywood star. They decided to make a pit stop and clean it up, with the singer receiving a few comments that he looked a lot like Usher. I mean, rightfully so. The resemblance is uncanny. “And bacon for breakfast,” added Usher. Instead of settling a seemingly unsolvable argument, James flipped on the radio, jamming out to Usher’s more recent hits, “I Don’t Mind” and “OMG.” That is, until they saw a group of people pushing their broken-down car in the middle of the road. Making a seemingly-record number of pit stops during Carpool Karaoke, the two decided to take another excursion away from their planned route and help them out. Their kind souls helped three other men push the driver to a nearby service station. “We’re putting out fires all over the place,” James noted. After committing their good deed, the pair finished off their carpool commute by finishing the song, “OMG,” complete with on-the-spot in-sync choreographed moves. It looks like Usher’s dancing advice helped out, after all.